When it all comes down to it, I'd rather a recipe taste fabulous than look attractive. But, I love it when you can have both. This year, I found myself concentrating on working up some new appetizer recipes for entertaining over the holiday season. And one of my favorite recipes just happens to be both attractive AND delicious. 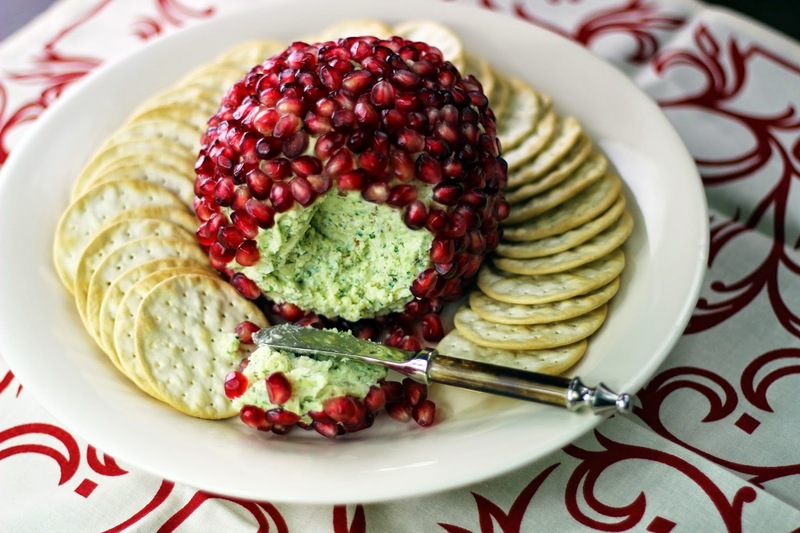 In fact, when it comes to looking festive, this cheese ball always steals the show. The cheese ball itself is based on the flavors in one of my own personal "guilty" pleasures -- the Merkt's Swiss Almond cheese spread. Turns out its easy to make, and (no surprise here) the end result is even more delicious than the pre-made version. 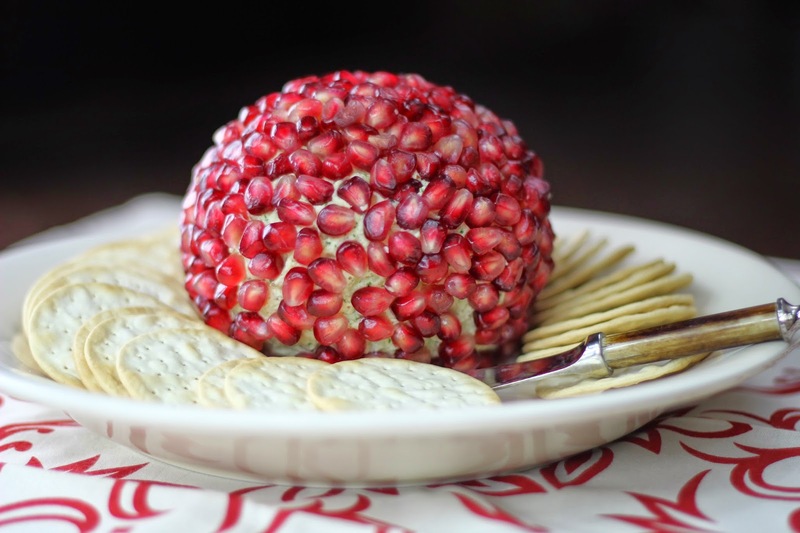 And then I went a step further and completely one-upped them on the presentation by coating the cheese in a swath of bright red fresh pomegranate seeds. Both beautiful and delicious, it’s the perfect addition to pre-dinner snacks or a full-belly appetizer spread. 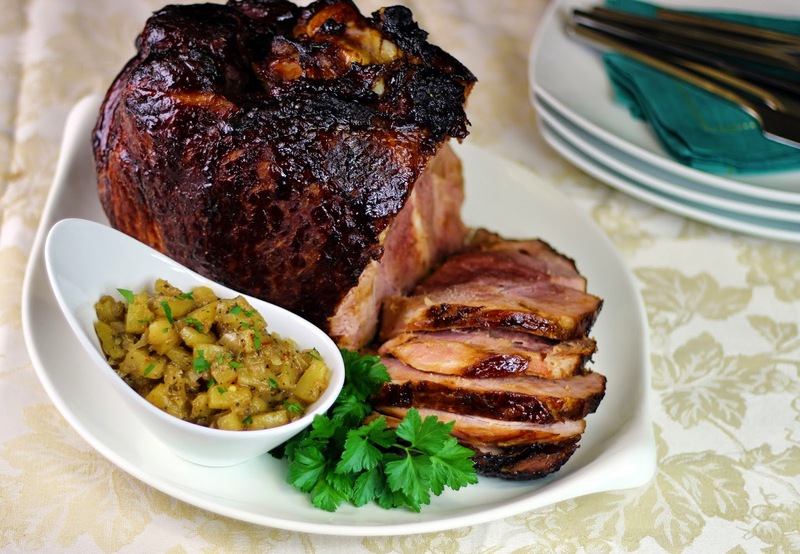 This ham is, I must confess, one of my favorite recipes. And I'm not a huge lover of ham (is that sacrilege to admit that around Christmas?). In fact, prime rib is generally my Christmas protein of choice, especially now that I have my timing down so that I can achieve a perfect medium rare. But, I have a bit of a soft spot for retro dishes lately. And very few things scream “iconic holiday centerpiece” like a glazed ham. But, I've never really been a fan of the pineapple and clove-studded variety. So, I decided to go there. Create my own recipe. This easy updated recipe yields a beautiful brown crust and juicy interior, thanks to just three ingredients – rum, molasses and real sweet cream butter. The sweet and sour pineapple chutney adds a warming fruity element to the rich, savory meat. But, I'll be honest, the ham itself is glorious on its own. The one catch? 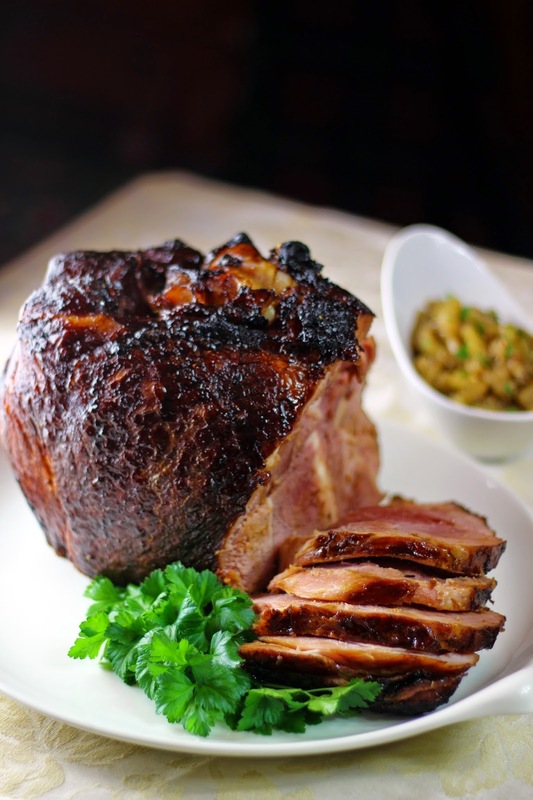 Take care to invest in a high quality smoked, bone-in ham for this recipe. Since there are so few ingredients, the quality of the meat matters. It's the little things that get lost in the shuffle. In the midst of holiday crazy, short-cuts are often where it's at. And we confess, we've fallen prey to less-than-domestic-goddess options on numerous occasions. YES! We've done it too. But, thanks to quick, easy recipes like this, I'm not sure we'll have to -- at least not around the holidays. First - the ingredients are basic. Flour, yeast, butter, milk, cheese. You keep all of those on hand, don't you? Second - it take about 15 minutes to prep the ingredients (which make two loaves/enough for a crowd). Totally do-able. Third - it can be baked right alongside your main course, or even during the time it takes for your prime rib roast, turkey, or ham rests. Fourth -- it's seriously delicious. So, before you pull out that bag of rolls from the supermarket, try your hand at this easy and delicious pull-apart bread recipe. 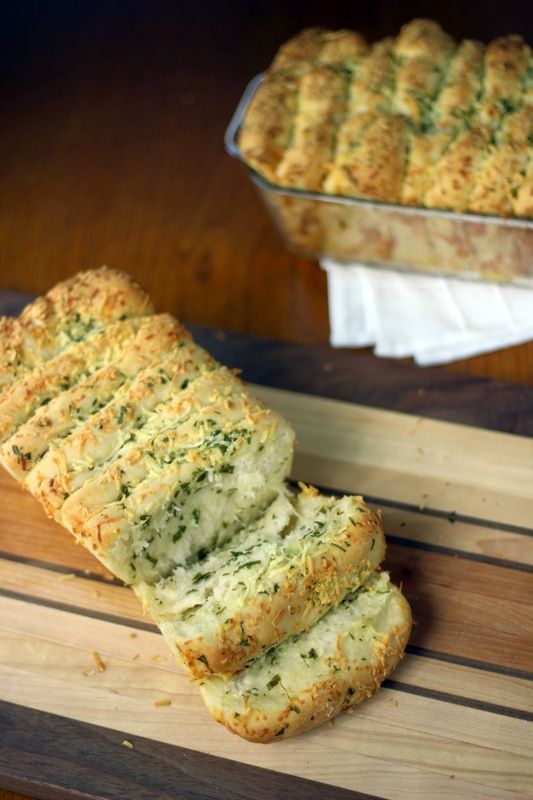 This cheesy, buttery pull-apart loaf is the perfect complement to weekend dinners or holiday meals. 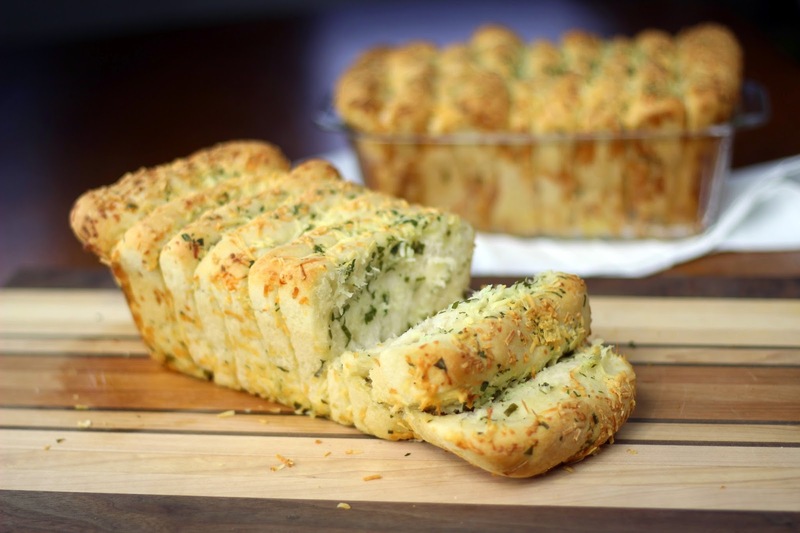 The garlicky butter mixture gives the bread a distinctly savory bite, and the Romano cheese adds a slightly salty umami flavor. We like it best served warm from the oven. 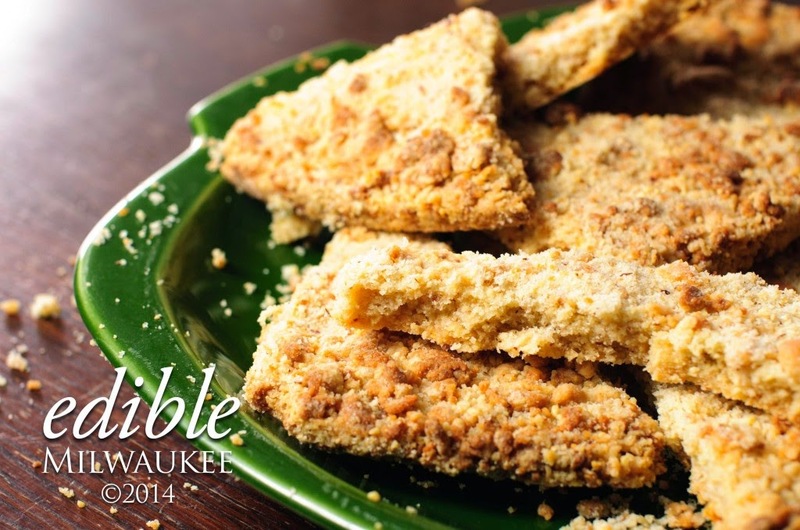 I recently had the distinct honor of writing an article for the winter issue of Edible Milwaukee magazine about traditions brought to America by Italian immigrants. 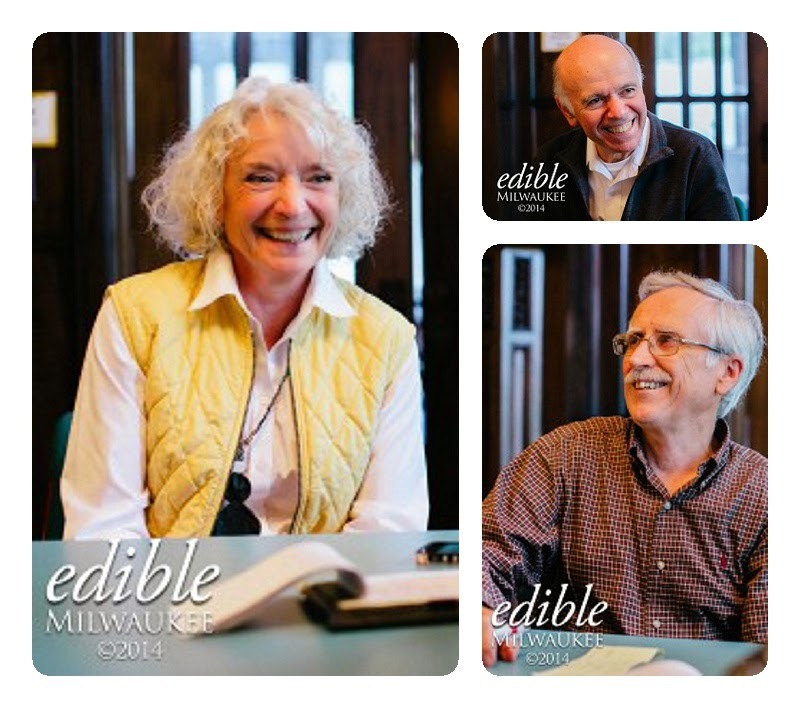 The article, Food Traditions of the Italian Diaspora, has been percolating for over a year now, and began when I met a woman named Silvana Bastianutti Kukuljan at the Southeast Wisconsin Festival of Books. I was hosting the cookbook stage, and she was making a presentation about the cookbook that the students of her Italian Language and Culture class had created. The cookbook contains a wide variety of recipes from members of the class -- many of whom are first and second generation immigrants and all of whom have connections to Italy through travel or interest -- as well as anecdotes and information about traditional Italian ingredients. Guides in the book also provide valuable information for food lovers, including guidelines about the appropriate times of the day to drink espresso, cappucino and the like. After hearing her presentation -- which included a wide variety of stories about how Silvana and members of her class preserved elements of tradition from their Italian backgrounds and experiences -- the thought of writing their story stayed with me. So, I was delighted when the concept seemed to fit with the theme of Edible's winter issue, which focuses on traditions, celebrations and overall conviviality. I'd love for you to read the article, but I also wanted to share an "out-take" that didn't make it to print -- a story shared by Riccardo Sarbello, about his role in helping to make the wine his father sold to friends and neighbors. Sarbello is a retired professor of physics at UW-Milwaukee whose parents emigrated to the U.S. from Toarmina, Sicily in 1920. They settled first in the lower east side of New York, eventually moving and settling more permanently in Brooklyn. “My father was a cabinet maker by trade. But, he also made wine and was the source of wine for many people where we lived in Brooklyn. When he would visit people – where you might bring candy or flowers or something – he’d bring a gallon of his wine, and that was very well accepted. In fact, my father courted my mother by bringing gallons of homemade wine to her family. He used California grapes. He always kept ties to the lower east side where he knew producers and importers of fruits and vegetables. So, in the fall when there were grapes available, he’d have them delivered to the house by truck. He’d take out the basement window and put a slide in. And then they’d push in all these crates – I can still see the “42” on the side of the crates that indicated 42 pounds – and they’d slide in one after another, after another. And then the grapes would go into the press. We had a big basement; it was one room. And there was a press in the middle with a long, long pole. So two or three people would actually help to push it all around; and I could play a role even when I was eight or ten years old. It was like those old pictures of Samson going around the grindstone. Then the wine was put into three large barrels and a fourth, smaller one. And for the first two or three weeks you’d have to stir them every night. And that was my job. I could do very little damage that way. I took a pole with a little square piece of wood attached to the bottom that I would push up and down and the bubbles would come up – bloop bloop bloop – that was fun. My father would always keep a special barrel from each batch. He’d keep gallons of wine from each year so he could say “this is from when my sister got married,” or “this was from 1963” or when this or that happened. Ultimately, those were the worst, because they’d gone past their flavor peak. But the yearly one was always delicious. Good strong red wine that everyone loved. And because I can't resist, I'd also like to share the recipe for Fregolotti that Sandragina Ebben shared with me. It's delicious (which I know firsthand from testing the recipe before I sent it it off for publication) and it makes me wish I had an Italian Nonna to teach me how to bake. Thank you so much to Sandragina Ebben, Silvana Bastianutti Kukuljan, Gustavo Ricca and Riccardo Sorbello for taking the time to share their stories. I'd also like to thank the Italian language and culture group at the Osher Lifelong Learning Institute at UW-Milwaukee for welcoming me into their world. I'm not sure what it says about me, but lately I'm all about stuffing things into vegetables. Can you be hollowed out and stuffed? If the answers to both questions are a resounding YES, then we're off and running. From there, it's just a matter of exercising a bit of creativity in deciding what kinds of things might be delicious when stuffed inside. For a while, I was stuck on making Quinoa & Chorizo Stuffed Peppers (so good). But, for the fall and winter, I wanted something a little bit different. So, I started playing around with squash -- which, let's be honest, are the perfect subjects for stuffing, what with their little bowl shaped halves and all. 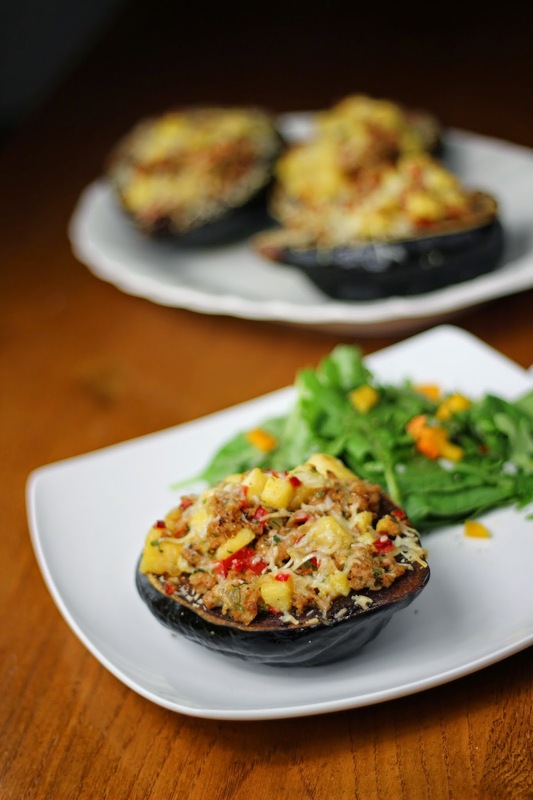 There are a lot of recipes for stuffed squash. But, I don't think there are many like this one. 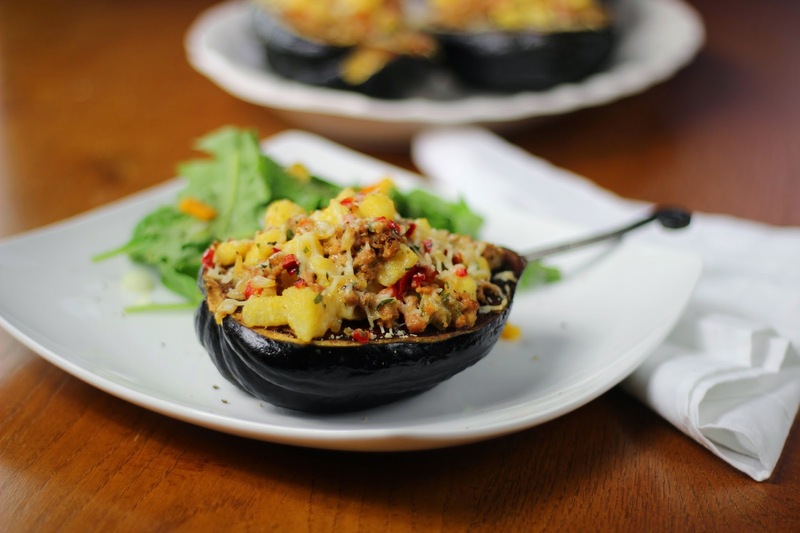 This Italian take on stuffed squash combines the rich, corn-forward flavor of polenta with Italian sausage and red peppers to create a rich delicious dish that’s perfect as a hearty side or served as a main dish with a side salad. Using prepared polenta saves time, but you can also make your own. Just spread cooked polenta into a baking pan and allow it cool before cutting it into squares.